Review: "Mission: Impossible - Fallout"
Who needs the stale 007 franchise when Tom Cruise is right there, still slaying on the silver screen in the remarkably fresh Mission: Impossible series? I'm hardly a Cruise superfan - in fact, I'm prone to steering clear of most of his pictures - and yet even I cannot resist the sight of him sprinting around, bouncing from building to building with seamless ease and more than keeping up with co-star Henry Cavill, more than 20 years his junior. That this franchise surrounds Cruise with a dynamite supporting cast (including, for the first time, the divine Angela Bassett), makes the proceedings all the more satisfying. 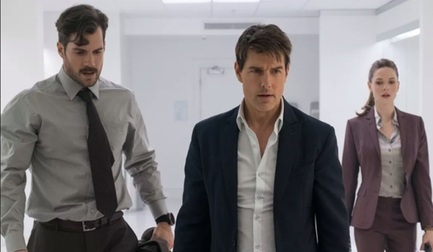 While the main attractions of Mission: Impossible are the countless set pieces, with Cruise acting like a madman on 24 Hour Energy, there is a plot in the picture, albeit a convoluted one that's increasingly difficult to keep tabs on. Ethan Hunt (Cruise) and his beloved IMF team (Simon Pegg and Ving Rhames, having a blast, per usual) are racing against time to prevent the terrorist group the Apostles from getting their hands on nuclear weapons that, should they be obtained, will be used for attacks on the Vatican, Jerusalem and Mecca. To Hunt's chagrin, the CIA assassin August Walker (Cavill) has been tasked by CIA Director Erica Sloane (Bassett) with monitoring Hunt and his team during the mission. To dive further into the proceedings, and the plethora of fights, chases, impersonations and so on that arise, would be to spoil the picture's many stimulating pleasures. Suffice to say, if you've gotten a kick out of prior Mission: Impossible sequels, you are guaranteed to have a ball here, even if, for my money at least, this still doesn't quite reach the sky-high heights of the first, Brian De Palma-directed entry. While Cruise overwhelmingly commands the screen with his awe-inspiring stunt work, he leaves room for his co-stars to shine, including the alluring Vanessa Kirby as the White Widow, a black market arms dealer; Rebecca Ferguson, back in action after appearing in Rogue Nation; and Pegg and Rhames, instilling heaps of humor into the proceedings. If there's a weak link among the ensemble, it's Cavill, who, with his matinee idol looks and lifeless acting abilities, most recalls an Abercrombie and Fitch mannequin. Christopher McQuarrie, back after writing and directing the fun, if inferior Rogue Nation, has improved upon his past contributions to the franchise, packing Fallout with one fabulous, action-packed sequence after another and avoiding the lulls that have at times plagued the series (most notably in the disastrous first sequel). Mission: Impossible - Fallout is a summer blockbuster that more than delivers the promised goods. And, I mean, it has Angela Bassett, so you obviously need to see it.